So last issue was all about the continuing ramifications of Captain Gloval’s ‘death’. I’m a little unconvinced that Gloval really is dead, but we need to see how this all plays out before we really know. In his absence Lisa Hayes has to step up as acting Captain, a role she struggles in. Not because she doesn’t have the ability or talent, but because she is so desperate to prove herself she is rushing into things, not thinking things through. Personally leading the supply mission to Mars base was a poor decision, as the attack by Khyron proved. More unsettling times seem to be ahead as well, as it seems her former partner Karl, currently present as a computerised memory, was assigned to the now abandoned base. All that intrigue and emotional depth is fine, but hey, this is Robotech, so where’s the fighting Furman? Oh, here it is, on the first page. And the second. And the…you get the picture. Furman gives us what we want, as Khyron and his alien fleet spring the trap on Lisa and crew, and Roy Fokker and the Destroid units defend the SDF-1. A brutal firefight ensues with the human side outgunned and outmanned, and acting commander Claudia Grant decides to launch the SDF-1 and retreat. At least, that was the plan. Sneaky Khyron has the ship held fast by anti gravity locks, so this has to play out to the end, one way or the other. So just when strong leadership is needed, Lisa Hayes is off talking to ghosts. Is Karl a ghost? a computer programme? whatever he is, he is leading Lisa inside Mars Base to somewhere. That somewhere seems to be deliberate, a hidden Reflex Furnace. The good news is the Furnace can be overloaded and used to take out the gravity nets trapping them there. The bad news, at the very least it will destroy Mars Base, at the worst possibly kill everyone. Still, with the battle being lost, what’s to lose? Roy Fokker gets his fighters to try and draw the alien fighters as close to Mars Base as possible, use their aggression against them. It works. Lisa escapes, base explodes, SDF-1 escapes, Khyron not happy. Textbook. Time to bury Captain Gloval, though the final page seems to confirm what I’ve been suspecting which is….let’s wait for next issue. This is almost writing by numbers for Furman. I don’t mean that as an insult, but a compliment, that he is so used to turning out great scripts the transition from Brian Wood has been seamless. Same great character work, same action, same great plots. As I was reading I actually thought this would make a great animated episode, a great compliment indeed. One constant is artist Marco Turini, solid as always with layouts and pacing, and seemingly mixing it up a bit more. The use of scale has improved from the first few issues, with bigger being better. 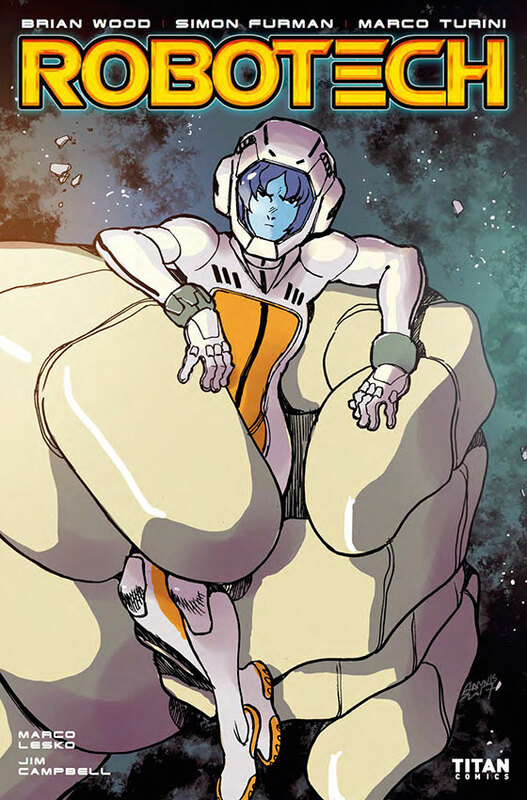 As a book Robotech delivers what you want it to. Action, a bit of intrigue, danger around most corners, and a little dash of characters doing both the right thing and the wrong thing. As enjoyable as it is, it still has some wiggle room to get even better, so I hope it can continue scaling those heights. I’d say let’s do it for Captain Gloval, but he’s not dead, right? It’s only a coffin after all.